To celebrate the 30 year anniversary of the Hong Kong Dragons, we’re taking a look back on the journey of the Dragons throughout the years, and joining them in a big year to celebrate this impressive achievement. <="" span="">The Hong Kong Dragons (later known as the Hong Kong Asian Dragons) were established in 1989 to recognize and train a group of both Asian & Chinese players able to represent Hong Kong on the national stage. By 1997, the Dragons consisted of close to 200 players, including a mix of Hong Kong natives, or those who worked/studied in Hong Kong, Japanese, Koreans, Taiwanese, Singaporeans and so on. A highlight of the Dragons’ story was the period between 1993 and 1995 when the Hong Kong Dragons toured Asia, playing in Singapore, Malaysia and Thailand over a total of 14 days, competing in six 15-a-side matches, and winning five highly competitive games, their only loss a narrow 3 pointer against the Thailand National team. 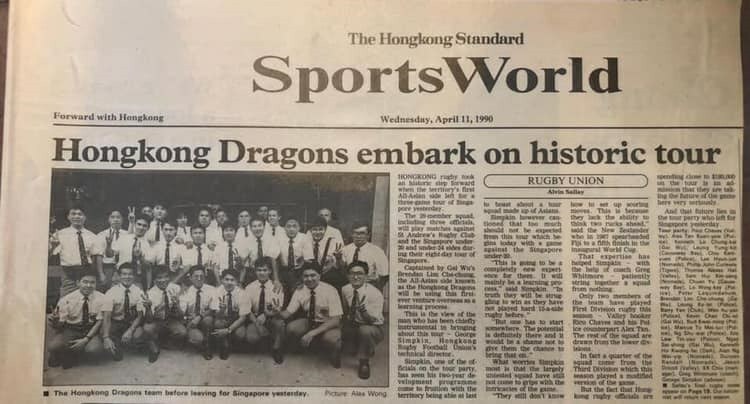 This year, to mark 30 years of the Hong Kong Dragons, the first ever coach of the team, former Hong Kong Technical Director (1988-1997), George Simpkin, will be hosting a reunion tour, which is sponsored by a number of the original team members, including Tom Hall, Henry Louie, and Rick Santos, along with Giordano, Leung Ka Ta, Culture and Leisure, and Reminderband. The touring party head to Manila in the Philippines on April 12-24, where they will play a friendly match against the Nomads Rugby Club Philippine Vets. Most of the Dragons players have not pulled on their boots for over 15 years, and the oldest player is an impressive 65 years old, whilst the youngest is a spritely 43! During the rest of the tour there will be some outreach activities with local Philippine schools to promote participation in rugby, and looking further ahead the Dragons are planning tours to Japan and Chinese Taipei later in the year. So a busy year in store for the Dragons! Here at the HKRU we’d like to congratulate Rambo Leung and the Hong Kong Dragons for their outstanding contribution to the rugby scene in Hong Kong, and wish them luck in their endeavors throughout Asia!